“Victory Huts” were prefabricated buildings developed during World War II as a method of providing quick housing for soldiers. 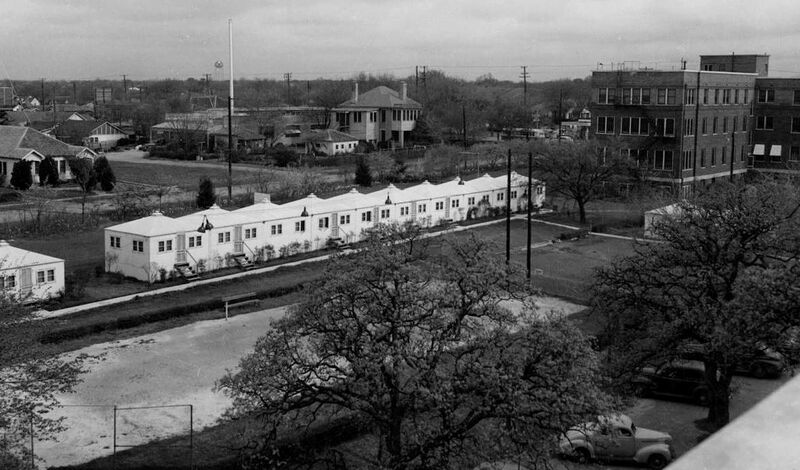 The white “Victory Huts” behind the Parkland Nurses’ Home are believed to have been used first as housing for recovering servicemen during World War II, then after the war as housing for nursing students. Victory Huts were the brainchild of builder H. F. Pettigrew and wealthy Dallas businessman Winfield Morten. Read about the beginnings of their wildly popular prefab buildings here. Top photo and quote are from the Parkland Hospital Collection at the UT Southwestern Library, accessible here. Advertisement from the Flickr stream of the Texas Historical Commission, here. Victory Huts were widely used during World War II, as cheap housing for military personnel, military families, and as housing in internment camps. See the huts as they were used for Japanese/enemy alien internment camps in Texas, at Camp Kenedy, at Crystal City, and at Dodd Field/Fort Sam Houston. When I saw these pictures I had one of those ‘deja vu all over again’ feelings, as I believe that the cabins in the Chisos basin of the Big Bend National Park in the early to mid 1950s were these very structures. All or most were little duplex units, in which the door between the sides could be opened for a large family, or locked for the use of two smaller parties. No plumbing, but the bathroom and shower facilities were just down the gravel path. The dining hall looked like what I imagine a summer camp might have had. Actually pretty charming in its own simple way. I lived in a Dallas hut in Morocco for 1 year, 6 month and 3 days. I was stationed with the 357 FIS from the fall of1955 to 1957. It was a temporary prefabricated structure. Two were connected together and had a oil fired heater. No AC or plumbing. The windows were shutters that were held open by a stick only installed from the outside. Each side had three windows with screen in two and plastic in the center one.Each hut was made with two floor sections, four sides,one side had a window, one had a door and the roof sections was four triangles. I would like to hear from anyone who were there. No communication back home except by snail mail.